Assessing Miami's Al Golden, Illinois' Tim Beckman and other coaches on the hot seat entering 2015. College coaching is a what-have-you-done-for-me-lately industry, and that comes as no surprise to the well-compensated men leading programs across the country. In the SEC West, each coach makes at least $4 million per year. One of those coaches will finish last in that division, and winning is the metric that ultimately matters in job security. This fall several coaches could face make-or-break seasons on the field. But whose jobs are really on the line? SI.com filters through a number of names to determine the hottest seats in college football. An initial look at Beckman’s work in Champaign points to a rebuilding job seemingly on schedule. Since winning two games in 2012, the coach has improved the Illini by two wins in each of the last two seasons. Last fall Illinois won six games with victories against Minnesota and Penn State. But one of the country’s worst defenses has plagued Illinois, including in last season’s embarrassing 35–18 bowl loss to Louisiana Tech. Moreover, Beckman’s reputation was called into question this off-season when former Illinois players alleged they were mistreated by the coach, allegations Beckman later denied. Beckman needs to make serious ground in the weaker Big Ten West to take pressure off his shoulders. It’s worth putting Golden’s mediocre tenure in Coral Gables in proper context. The former Temple coach inherited a team aching from NCAA troubles due to the Nevin Shapiro scandal. Golden still managed to tie for the Coastal Division title in 2012—Miami withdrew from bowl consideration due to the ongoing NCAA inquiry—and started 2013 with a 7–0 record. But the Hurricanes are 8–11 since with two straight bowl losses. Golden, who is 16–16 in ACC play with the ‘Canes, sent seven players from last year’s roster to the NFL draft. Now it’s time for him to produce with that kind of talent. In London’s second season in Charlottesville in 2011, Virginia won eight games and reached the Chick-fil-A Bowl while the coach earned ACC Coach of the Year honors. But that campaign represented the high-water mark of London’s tenure with the Cavaliers. The coach is 11–25 in the three seasons since. London knows how to win, having compiled 25 victories in two seasons leading the Richmond Spiders. But with just nine total starters back in 2015, London faces an uphill battle. Anything short of a bowl game could spell doom for Virginia’s head man. Caragher won eight games on four occasions and compiled a 44–22 record at San Diego prior to arriving at San Jose State in 2013. But that pedigree hasn’t produced results. The Spartans, who went 12–2 under former coach Mike MacIntrye in 2012, immediately fell from grace with a 6–6 season in Caragher’s first campaign. Last year the program lost its final six games en route to a 3–9 season. The coach better hope for a turnaround in year three, where there’s reason for optimism in San Jose. The Spartans inked the top signing class in the Mountain West in February and return eight starters return on offense. Haynes inherited an 11-win team when he took over at Kent State in 2013. The Golden Flashes have done nothing but regress since. Haynes is 6–17 in two seasons, including last year’s 2–9 campaign. The good news is Kent State returns 14 starters this season, not including productive back Trayion Durham, who missed all of last year with a foot injury. The bad news is Haynes must find a way to fix an offense that ranked 12th or worse in the MAC in every major category in 2014. The Hoosiers started last season with a 4–1 record, but that momentum stalled when quarterback Nate Sudfeld went down with a shoulder injury in a loss to Iowa. Indiana promptly lost its next five games despite the efforts of running back Tevin Coleman, a 2,000-yard rusher. Wilson’s Hoosiers haven’t disappointed on offense, ranking sixth or better in the Big Ten in yards-per-play for three straight seasons. The wins, however, haven’t followed, and Wilson might need a bowl game to avoid the chopping block in Bloomington. Coaches usually aren’t hot-seat candidates after only one season, but Mason might be an exception. That’s because his first year as Vanderbilt’s head coach was worse than expected. The Commodores won just three games, lost all eight SEC contests and fell to Temple at home by 30 points. 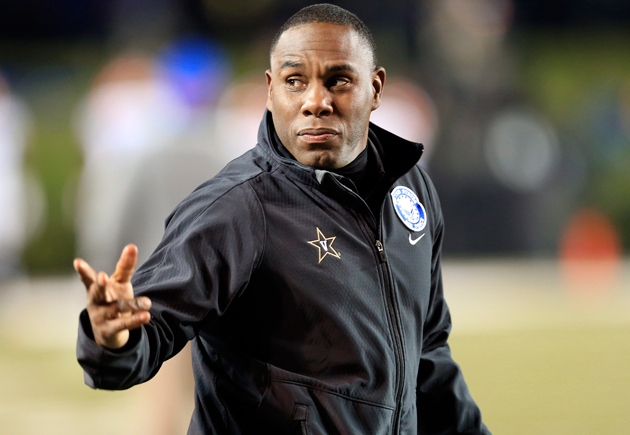 While Vanderbilt is easily the toughest job in the SEC, Mason arrived at a time when ‘Dores’ fans believed they could win: His predecessor, James Franklin, posted two nine-wins seasons during his tenure. Another year without a substantial step forward could spell an early end for Mason in Nashville. ​Rhoads took over for the departed Gene Chizik before the 2009 season and led Iowa State to a 7–6 record, an upset of Nebraska and an Insight Bowl win over Minnesota. The Cyclones haven’t posted a winning season since then. That’s not good news for Rhoads, who is fresh off leading Iowa State to a 2–10 season in 2014 and its first winless Big 12 campaign since 2008. The roster returns six starters, including quarterback Sam Richardson, in an offense that should be smoother under second-year coordinator Mark Mangino. But the future look bleak for Rhoads with a defense that finished last year 125th nationally in total defense. Prior to Taggart’s first season at USF in 2014, a school marketing campaign implored Bulls’ fans to “get on the bus” with their new coach. That bus is pretty empty after two seasons of Taggart’s reign. The coach is 6–18 in Tampa, though he improved from his first season (2–10) to his second (4–8). He also hasn’t won more than three American Athletic Conference games in a season. Taggart fired both his coordinators after last season and spent much of the spring installing an up-tempo attack. But with only eight total returning starters against rising programs like Cincinnati, Temple and East Carolina in the AAC East, Taggart faces an unenviable situation in his third year in town. Ferentz has been at Iowa since the 1999 season, and in the early 2000s the coach brought two Big Ten titles and three 10-win seasons to Iowa City. But since Iowa famously extended the coach’s contract by 10 seasons in 2010, Ferentz is 34–30, including 19–21 in Big Ten play. Yet Ferentz was still the ninth-highest paid coach in the country in 2014 at $4.075 million, according to USA Today. His contract also features a steep buyout. At this point Iowa is little more than a middle-of-the-pack Big Ten program, but surely Hawkeyes fans expect more for their dollar. Maybe Ferentz delivers more in 2015, when his program won’t play Ohio State, Michigan State or Penn State from the East. LSU has won a national championship once under Miles (2007) and played for another as recently as 2011. But the Tigers have seemingly fallen to the wayside in the SEC West during the last two seasons, when Miles is 9–7 in league play. Another lackluster campaign in Baton Rouge could make the natives restless. The question is whether the school would stomach the financial burden of firing Miles. As SI.com’s Andy Staples noted this summer, LSU would owe Miles $15 million if it fires him before Jan. 1, 2016 and $12.9 million after the New Year. That’s hardly an easy call for athletic director Joe Alleva. Richt’s spot on the hot seat is an annual barstool topic in Athens. The longtime coach has 136 wins in 14 seasons at Georgia, which averages to better than nine wins per season. He’s also won two SEC titles. But many Bulldogs fans expect more from a program located in the talent-rich state of Georgia. Moreover, Richt’s longevity doesn’t tell the whole story; the coach’s last SEC championship came in 2005. It’s hard to believe Georgia would run Richt out of town, but 2015 could be a telling year for the coach: The media picked the Bulldogs and stellar running back Nick Chubb as the favorites in the SEC East.